2 cups of leftover beef stir fry with brown rice (440 calories). Haha finally done with this. I had to throw some water on top before I zapped it to make the rice softer. 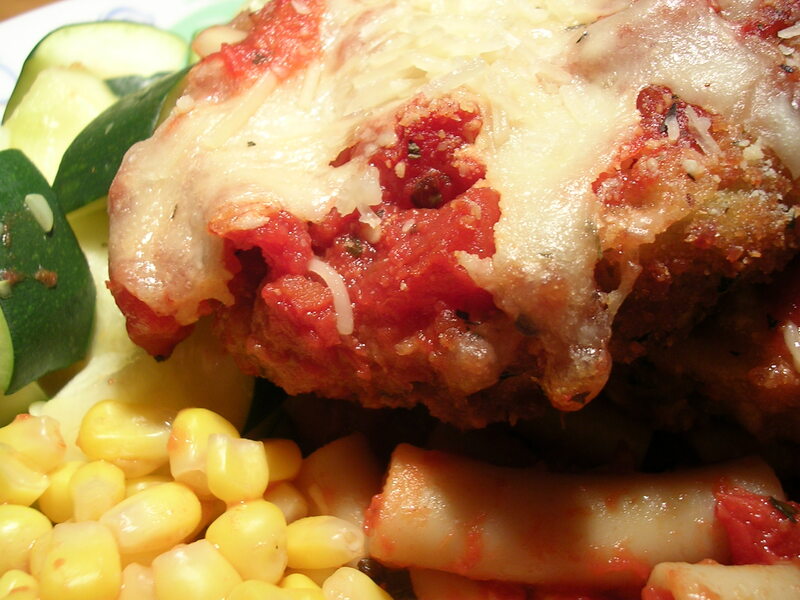 Eggplant parmesan with pasta (2 rounds of eggplant parm, ~250 calories, 1 cup of ziti pasta, 200 calories, 3/4 cup of squash 20 calories, 1/2 cup corn, 80 calories). Yum, I love eggplant parm. I daresay that I like it better than meat parms. Why? Because they're never dry inside, they're always moist and the texture is amazing. Crispy crunchy coating with the soft bite of eggplant inside. Plus, unlike a slab of meat, you get to eat more of it before you start feeling full. Rest of the eggplant parmesan (250 calories). I was starting to get really hungry during my practice mcat, which was throwing off my concentration. But it was good to recharge afterwards. Total for today is 1320 calories. I wonder what I'm going to be eating tomorrow and the day of my mcat. This entry was posted on Friday, April 6th, 2007 at 6:46 am	and posted in beef, Chinese, Italian, poultry, snacks, Uncategorized. You can follow any responses to this entry through the RSS 2.0 feed. Hope your test went okay yesterday!!! What a thing to have to do Easter Weekend…but today, you can kick back, eh? Thanks! The test was actually kind of hard, but it feels so good to be done! Yesterday was the first night in weeks that I wasn't tossing and turning in bed for hours before falling asleep. Must have been all the stress haha. Happy Easter!